I just want to report that I have just installed 19.1.04 and for the first time can not get the software to talk to the wireless connection of this printer. select option 1 and follow the install prompts. Then localhost:631 add new printer etc. always worked. As we no longer have yaourt, I used trizen to do the install (very same as with yaourt). But the results after the localhost install failed. I have posted some shots of the mess. Something has changed from December iso's to the new one besides the loss of yaourt. Last edited by gabbman on Fri Jan 18, 2019 2:50 am, edited 1 time in total. At this time I do not need to install my drivers of my canon 7750 anymore. Did you need to install the drivers before? Then do not do this anymore and see what happens out of the box. Yes I did, out of habit. Just taught this old dog a new trick. I just did yet another clean install, update and pksyua then attempted to install the wireless printer from both localhost:631 and the printer manager, and both did not see the printer. Trizen mg3500 to install the drivers, and now localhost:631 sees "Canon-MG3500-series_D8-49-2F-AE-EB-4C-1 " and a test print "cannot specify model number." So the change is not working as advertised. Can not print. 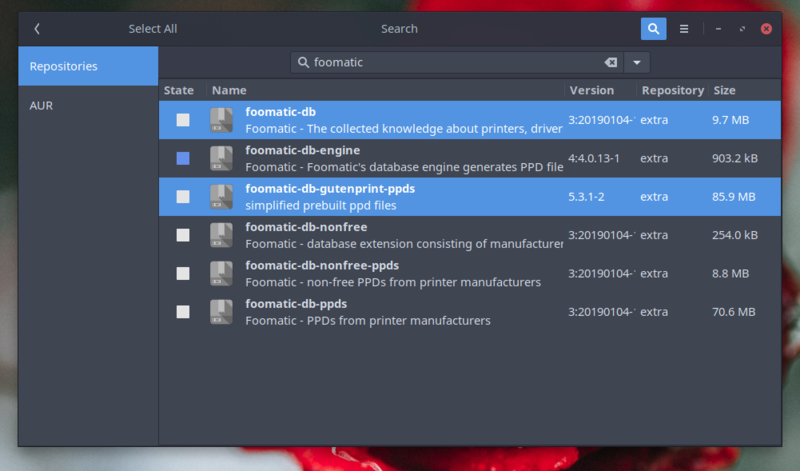 See if adding the foomatic database of printer drivers can solve your issue. You can install more if these two blue hightlighted packages do not work. That did not fix it, I feel that it is not being wireless detected. On other arch based operating systems when I ask localhost to find new printers, I am given a selection of 3 to choose from (EVEN PREVIOUS VERSIONS OF ARCOLINUX) and the choice of Canon-MG3500-series_D8-49-2F-AE-EB-4C was never the right one. It was usually just Canon-MG 3500 and then the trick was to select the correct PPD, normally the CUPS+Gutenprint v5.3.1 , which in this case is the selection. are you saying you do not have wireless? Is that the lo you refer to?